Cardinal Newman College in Preston City Centre is well established as one of leading sixth form colleges in the UK. 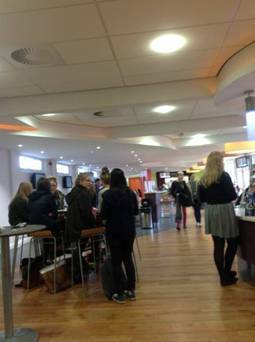 Up to 110 students occupy the Café during peak periods. This often led to an overheated and stuffy environment despite a high number of opening windows affording natural ventilation. The college was keen to find a solution which would be effective but would not significantly increase their carbon footprint. 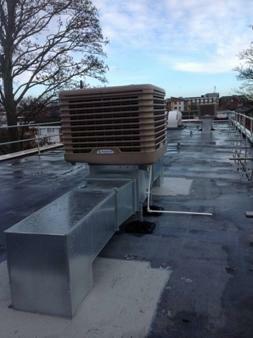 Having recognised that ventilation alone simply did not work ENSOL were asked to carry out a free survey to determine the most cost-effective solution in terms of capital and running costs. Calculations determined that the combination of heat gains from personnel, catering equipment and solar transmission through the south-facing windows equated to a total cooling requirement of over 45KW. A Direct Expansion (DX) refrigerant-based air conditioning system would consume over 15KW of power to achieve this. Following successes in similar applications, ENSOL installed two evaporative cooling systems with the cooled air being distributed using insulated ductwork above the suspended ceiling, supplying a total of eight swirl diffusers. The systems are capable of cooling the incoming air on hot days by up to 10 degrees C using only water. The incoming air is passed over wetted pads integral to the coolers. As the humidity of the air increases, the temperature falls. The coolers also filter the entering air. The whole system uses less than 3KW of power and delivers a cooling capacity equivalent to around 60kW. Savings in electricity costs of over 80% were predicted when compared with DX cooling. Opening windows continue to provide the necessary natural extract ventilation. Each system is controlled automatically from a digital thermostat which regulates the cooler water pump operation and adjusts the fan speed depending on the room temperature relative to the temperature setting.